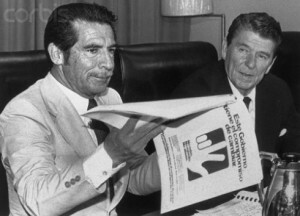 Ríos Montt in the early 1980s. A former U.S.-backed dictator who presided over one of the bloodiest periods of Guatemala’s civil war has no amnesty from charges he ordered the murder, torture and displacement of thousands of Mayan Indians, a judge ruled Thursday. … human rights advocates saidJudge Miguel Angel Galvez’s decision is an important symbolic victory for the victims of one of the most horrific of the conflicts that devastated Central America during the last decades of the Cold War. … Rios Montt is accused of authorizing 1,400 human rights violations, the displacement of 29,000 indigenous Guatemalans and 1,771 killings, many under a program intended to completely eliminate an indigenous Mayan ethnic group known as the Ixil.